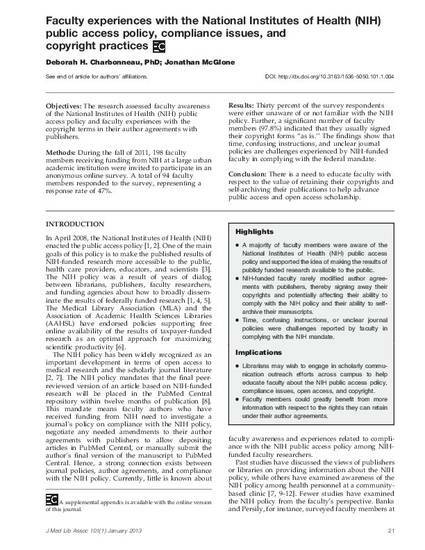 The research assessed faculty awareness of the National Institutes of Health (NIH) public access policy and faculty experiences with the copyright terms in their author agreements with publishers. During the fall of 2011, 198 faculty members receiving funding from NIH at a large urban academic institution were invited to participate in an anonymous online survey. A total of 94 faculty members responded to the survey, representing a response rate of 47%. Thirty percent of the survey respondents were either unaware of or not familiar with the NIH policy. Further, a significant number of faculty members (97.8%) indicated that they usually signed their copyright forms “as is.” The findings show that time, confusing instructions, and unclear journal policies are challenges experienced by NIH-funded faculty in complying with the federal mandate. There is a need to educate faculty with respect to the value of retaining their copyrights and self-archiving their publications to help advance public access and open access scholarship.